German poet and teacher; born at Posen July 17, 1800; died at Berlin Sept. 24, 1841. Basch was a somewhat precocious child, being able to expound the Talmud when twelve years old. A year later he became secretary to the mayor of Landsberg, but resigned the position to attend the yeshibah at Prenzlau, where he studied German, French, and Latin under Rabbi Josef Albu. 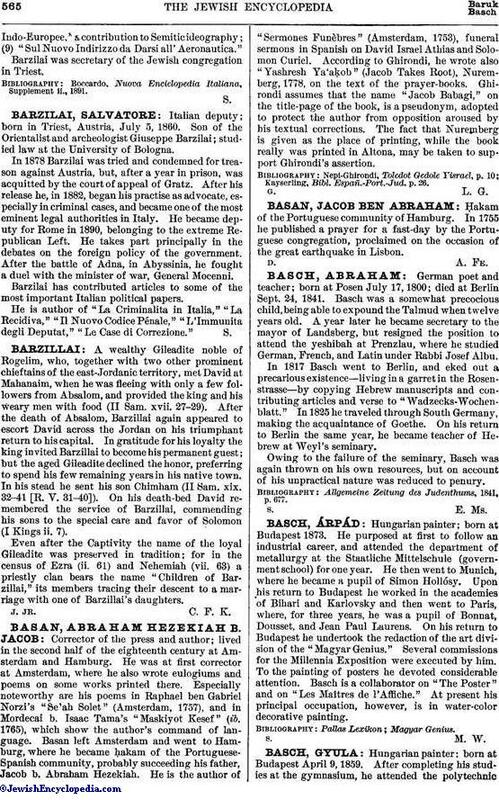 In 1817 Basch went to Berlin, and eked out a precarious existence—living in a garret in the Rosenstrasse—by copying Hebrew manuscripts and contributing articles and verse to "Wadzecks-Wochenblatt." In 1825 he traveled through South Germany, making the acquaintance of Goethe. On his return to Berlin the same year, he became teacher of Hebrew at Weyl's seminary. Owing to the failure of the seminary, Basch was again thrown on his own resources, but on account of his unpractical nature was reduced to penury. Allgemeine Zeitung des Judenthums, 1841, p. 677.